Every wife should have a stash of “go-to” recipes she can make for whenever a certain occasion arises. The one recipe that I believe trumps all other recipes in the arsenal is the cheesecake. This light, creamy dessert compliments all genres of food and pleases nearly every palate. Crusts can range from crushed cookies to chopped nuts or skipped altogether. Fillings can be “classic” or dressed up for a unique twist. Toppings can be thin, thick, mixed with the batter or left off for a strawberry puree topping instead. 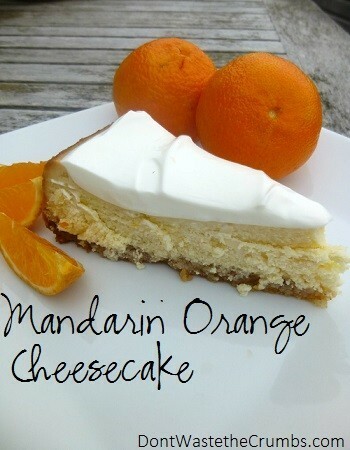 After many failed attempts, this mandarin orange cheesecake is a simple variation of my official go-to recipe. With two minor changes, this can become a delicate vanilla bean cheesecake. A slightly different swap creates a strawberry key lime cheesecake. The substitutions are easy and limitless, making this the perfect cheesecake to add to your collection. Preheat the oven to 350 degrees. Butter and lightly flour the bottom and sides of a 9″ springform pan. In a food processor, pulse nuts until finely chopped. Add melted butter and pulse until ingredients are combined well. Press the nut mixture evenly into bottom of prepared springform pan. Bake crust for 10 minutes; cool on a wire rack. In a large bowl, beat cream cheese on low until very creamy, taking care not to whip air into the cheese. Scrape down sides and add sugar, beating on low until smooth. Scrape down the sides and add one egg at a time on low, beating until fully incorporated and smooth. Finally, add mandarin orange zest and juice, beating on low until smooth and fully incorporated. Pour filling into cooled pie crust. 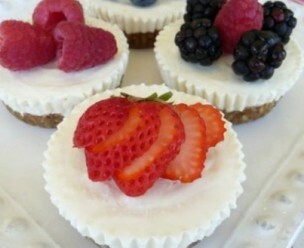 Place unbaked cheesecake in the oven and cover with a cookie sheet; bake for 20 minutes. Uncover the cheesecake and continue to bake for 20-30 minutes, until center is set but slightly jiggly like Jell-o. Remove cheesecake from the oven and cool for 10 minutes. In a small bowl, combine sour cream and sugar. Spread over still warm cheesecake and bake for 5 minutes. Cool to room temperature before storing covered in the refrigerator. Cheesecake is best when prepared the day before. *Substitute all of the juice and zest for another fruit or extract to create your own family favorite flavors!